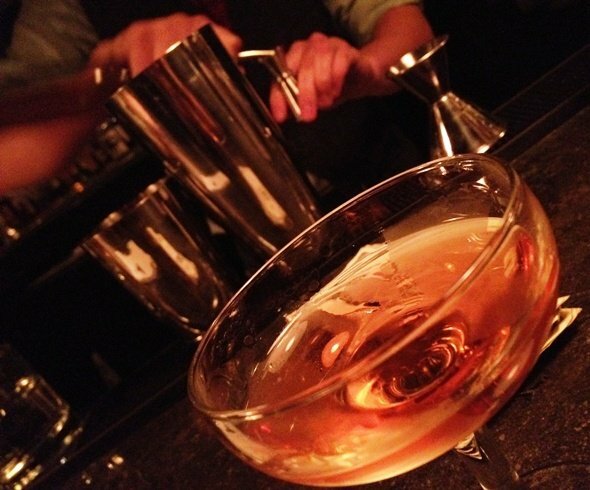 When I lived out in San Francisco, cocktail hour was just that. 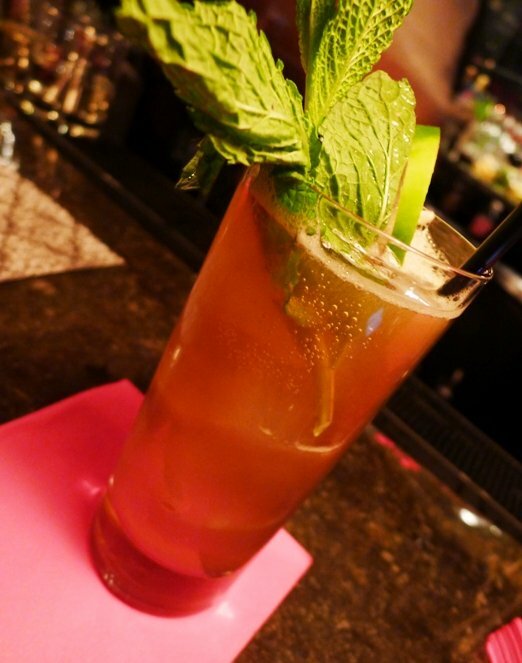 Mixed drinks with a bit of panache and meant for some serious sipping. Chrome shakers, lots of ice and specialized barware. Out here in North Carolina, beer is the drink of choice but that may be changing soon! Over the last couple of years, cocktails are slowly becoming a great option in the Triangle when you’re looking for some high quality libations. First came the fantastic Foundation bar in downtown Raleigh on Fayetteville Street. Then the clubby Whiskey and Roxy out in Durham on Main Street. And with the recent opening of C. Grace on South Glenwood we may now have the BEST cocktail option right here in the Oak City! Look for their discrete awning and white lights next to Cafe Helios. Pop down the short set of stairs, open the door and whoa… What used to be Trim has been transformed into a cozy but spacious speak-easy. An iron grill and antique couch guard the entrance right behind the double door. 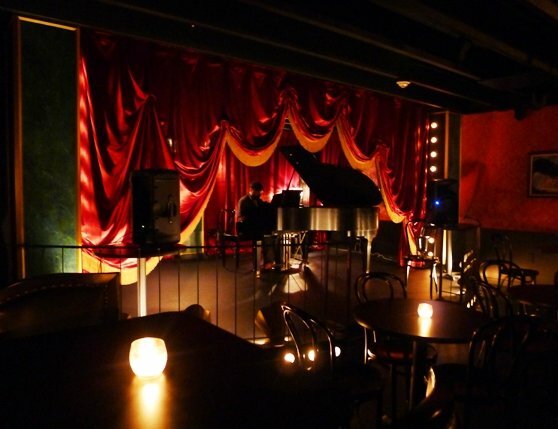 Once your eyes adjust to the dim environment, you’ve got a lovely curved bar to your right, cafe seating, a stage and a piano to your left. 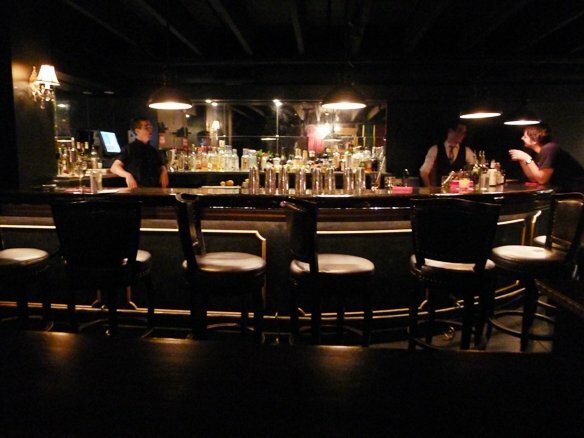 Each small table is lit up by a small glowing lamp, adding to the clubby ambiance here. But I like to grab a seat at the bar where you can watch one of C. Grace’s talented bartenders dazzle you with their mixology skills! The cocktail menu here is small, focused on the classics with high quality ingredients and a twist. Even their dense ice cubes are shaped for maximum surface with a minimum of melting and dilution. 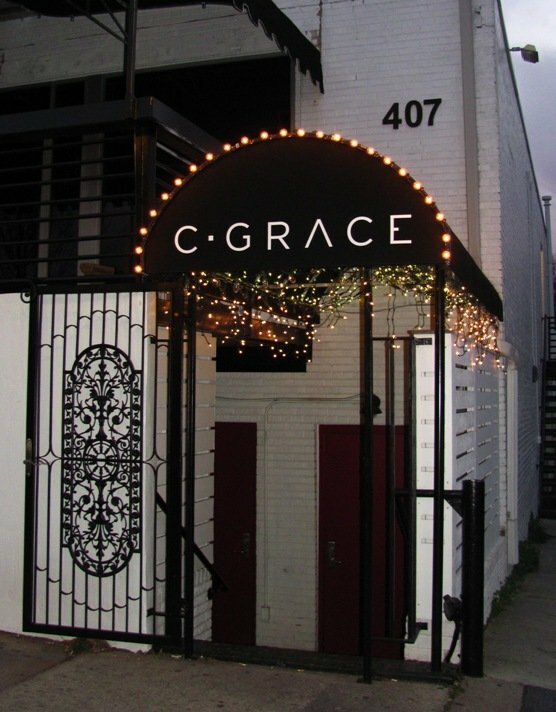 C. Grace has a standard menu of classics like a sidecar, whiskey sour, negroni or martini but my favorites fall into their specialty cocktail category. Cocktail guru and bar manager, Matthew Bettinger has done a fantastic job of inventing new drinks while maintaining a classic feel. The Jack of Hearts is a nice mix of brandy, rye and chocchi which ends up as a potent drink in a small glass. The Earl’s Tea is another favorite: Earl Grey, bourbon and lemon. And the Mendacity (lemon, sugar, gin) is a light and smooth cocktail for easy drinking. The guys behind the bar at C. Grace are professionals and will sometimes dip a straw in for a taste just to make sure they’ve got everything right. Just like a chef making sure the food meets their stringent expectations. And the cocktails are served in small, champagne like glasses. A bit dainty but yeah, treat that cocktail with some respect! While C. Grace has its drinks down cold, they’re still working on the entertainment options here. Jazz trio’s, fortune tellers, mind readers and more have been on the schedule but expect more goodness moving forward. If you’re not into the bar or front stage area, out back they’ve also got some quiet space with velvet pull curtains for some privacy. Overall they’ve done a fantastic job decorating the interior to give it a luxurious 1920’s feel and style. 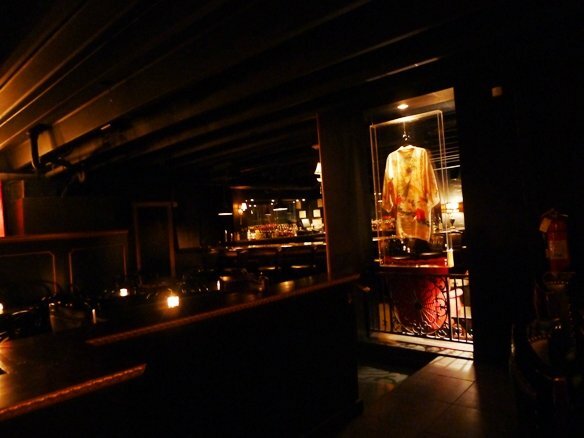 The space works for an intimate date night or group hangout with all the room here! It’s obvious a lot of love, care and effort was put into C. Grace’s decor. But of course, bars are all about the people from staff to customers. The crowd and mood at C. Grace can vary tremendously. Stop in on a weeknight and you’ll have the place nearly to yourself, things will be quiet and mellow. 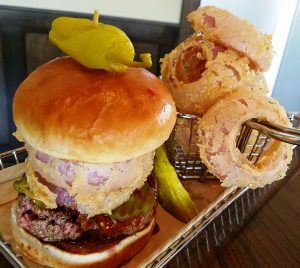 Come in on the weekends and the craziness of S. Glenwood spills into the place with a buzzing crowd. So time your visits according to your mood. 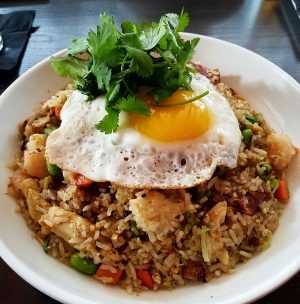 But in the end, C. Grace is a fantastic new entry to the South Glenwood and Raleigh cocktail scene. 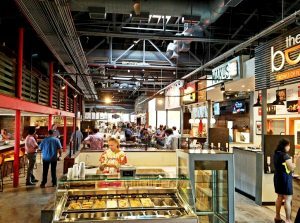 And with all the restaurant options in the area you’ll have plenty to eat before or after your visit. Whether you’re a hipster, preppie, married or single, you’re going to love this place! Anyone with an appreciation for good drinks will understand exactly what they’re trying to do here and the beauty of it all is that C. Grace is priced a bit lower than Foundation or Fox’s. So whether you’re starting or ending your night at C. Grace, stop on by. I promise you she’ll treat you right, cheers!